[CDU ESL 연예뉴스 잉글리시 스캔들] 김연아 '공항패션' 눈길끄네! 피겨 퀸 김연아가 드디어 출격에 나섰다. 3일 오전 11시 인천공항에는 크로아티아로 떠나는 김연아 선수를 응원하기 위해 엄청난 취재진과 인파가 몰렸다. 김연아는 출국에 앞서 준비된 기자회견장에서 간단한 인터뷰를 진행했다. 이날 김연아는 짙은 그레이 컬러의 트레이닝복과 단정하게 빗어 넘긴 머리, 화장 끼 없는 맨 얼굴의 깔끔한 스타일에 클래식한 워치 ’로만손 벨라’를 매치해 단정하면서도 고급스러운 공항패션을 선보였다. 김연아는 담담하고 차분하게 인터뷰를 이어갔다. 한편, 김연아는 이번 대회에서는 김연아는 새 쇼트 프로그램인 ’Send in the Clowns(어릿 광대를 보내주오)’와 프리 스케이팅 프로그램인 ’Adios Nonino(아디오스 노니노)’를 처음 공개한다. 특히 프리 프로그램인 ’Adios Nonino’는 강렬한 탱고 리듬과 변화무쌍한 곡 전개가 특징인 곡이다. 김연아의 출전으로 전세계인의 관심이 집중된 ‘2013 골든 스핀 오브 자그레브’는 6일 오후 9시 MBC에서 생중계 될 예정이다. KIM YUNA arrives in Croatia… Her airport fashion outshines ‘Heritors’. Figure skating queen Kim YUNA was finally make a sortie. 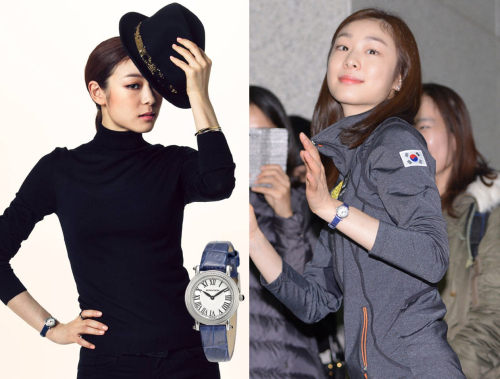 Incheon International Airport was crowded because reporters and fans gathered to cheer YUNA KIM last December 3, 11:00 A.M. Prior to departure, YUNA KIM was progressed brief interview at prepared press conference. This day, she showed off neat and luxurious airport fashion wearing dark gray color training suits, neatly passed and combed hair, no makeup and matched classic style watch ’Romanson Bella’. She assumed a disinterested attitude on the interview. Meanwhile, KIM YUNA first released a new short program ’Send in the Clowns’ and free skating program ’Adios Nonino’ in this competition. Especially, free program “’Adios Nonino is featuring a song of an intense tango rhythms and deployment of ever-changing music. The world’s interest was focused on Kim’s appearances. ’2013 Golden Spin of Zagreb’ was broadcasted live last December 6, 9 P. M. at MBC.